Well, that changed my future plans some. Here I was dreaming of the day I would have more time to do all of these things I wanted to. And I now hear that when your children grow up and move out, they are even harder than when they lived with you…I am still asking opinions on this one (so far, all affirmative) and wrapping my head around it. So maybe you never get this time I dream of. That was a fanciful object I experienced before I ever bore my first child. As my children have grown (now 8, 6, 4, and 1), I have seen that yes, it is true that I do not have more time now. As an 8 year old, Brayden does not take up less of my time than he did as a 2 year old. You have the normal time you would spend with a child, you have teaching how to clean or cook, you have listening to descriptions of the latest Lego creation, you have driving to and watching sporting events and other extra curriculars, you have helping in school, you have helping with homework, you have helping practice piano, you have playing catch…it all takes time. 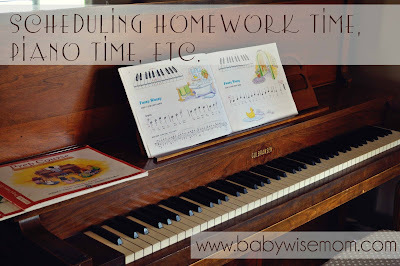 There are certain things you do that require time and require some real focus from you as a parent, like homework and piano. These are moments when it is helpful if you can focus in on the one child. So how do you provide the help each child needs while still parenting the others? First, I must say, if you are paying for your child to take some sort of lessons, it only makes sense that you have your child practice. I know my children’s piano teacher has students who don’t practice at all. What is the point in paying for lessons if you don’t do the work you need to do to learn? Students who don’t practice progress so slowly that they often end up dropping out at some point. So making sure this practicing happens is important. This is really an extension of all of the scheduling practice you got when they were younger. I remember juggling naps and independent play…now I juggle homework, piano practice, driving kids places, and so forth while still having to juggle those naps and independent play. So first, pick the time of day you are going to do whatever it is your child needs help with. Before school? After school? After dinner? Do what works for your family. Have it be part of your routine. A note on scheduling, I find it works best for our family to do these things first. Just like chores, we get the homework and practicing done before we start playing. It is so much easier for a child to find motivation when they have playing to look forward to than it is to interrupt play to do work. Your child might need a snack before you start homework or practice. If so, do it. Hungry children are grumpy, distracted, emotional, and non-compliant. This is probably the biggest concern of people–how to manage the other children while one child needs your full attention. Schedule your other kids around it! If you have a baby, have this practice/homework/whatever time happen during a nap of baby’s. All you need is to have an explicit activity that your child is supposed to be doing. Do not hover over your child as your child does his homework or practices his instrument/sport/whatever. Be close and ready to help if needed, but you want your child to be able to work independently as soon as possible. You will need to check homework and correct notes/form sometimes, yes. But you don’t need to guide the child through every problem and note on a regular basis. Having your child be relatively independent in these activities makes it so when the next child comes along and starts school or music lessons or a sport and needs your attention and help, you can offer it without completely overwhelming yourself. You can also get to the point where one does homework while one does piano and you can help as needed. I usually clean something or cook something while they are working on whatever they are working on. Sometimes I read or just plan things. These are activities I find I can usually step away from quickly and easily. I don’t want to be totally wrapped up in something and unable to help when needed, but I also want to be distracted enough I don’t turn into helicopter mom. With children one or older, you can be pretty consistent and predictable. With a baby, however, you have growth spurts and random wakings to work around. Have a “Plan B” if the baby is not cooperative during your regularly scheduled homework/practice time. It is much easier to meet disruptions with grace when you have a game plan. Having a plan B will also help you prevent that moment the next morning when you are walking out the door and suddenly remember your child never did homework the night before…never a fun realization. When is your homework/practice time? What are your tips for making this work?